So the problem with LP’s Rose is its price. I do not like to spend a lot of money on a category that I am not fond of, even if the wine in question is one of the standouts. So I am always on the quest to see if there is an alternative. Let’s just say it is not easy to find. That is what I thought, until I came across Franz Weninger’s Brut Rose this past summer. Franz Weninger is an Austrian wine maker near the border of Hungary. Weninger has three properties. One in the central Burgenland region of Austria, one in the Sopron/Balf region of Hungary and a joint venture with Attila Gere in Villany, one of the best red wine appellations in Central Europe. Mr Weninger has entrusted the operations of the Sopron/Balf winery to his son, Franz Reinhard, who is making some really interesting wines. One of these is a quite untraditional, yet quite tasty, sparkling rose brut made from the Central European Kekfrankos varietal. 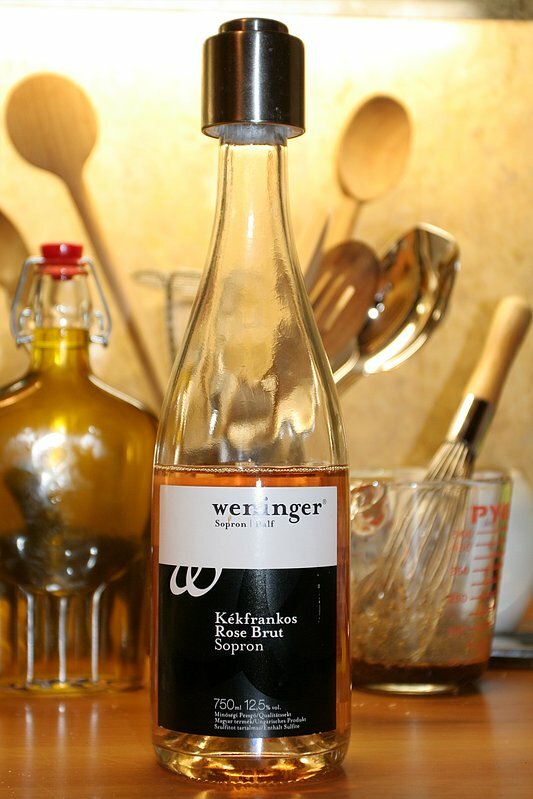 The Weninger Kekfrankos Rose Brut is a fantastic sparkling wine. If you like rose Champagne, you will like this one. The bubbles are a bit more sumptuous and a bit rougher than those of LP’s rose, which means the wine is a bit less elegant but also very approachable and not intimidating by any means. It is fruitier than the LP, and because of the Kekfrankos grape, it has a bit higher acidity, but all in all I think it compares favorably. If you want to celebrate, I still recommend the LP rose, but if you want to just open a bottle of sparkling wine on a hot summer night, I think the price/value ratio of the Weninger rose brut is hard to beat. Good luck finding it, though, Franz Reinhard does not make more than a couple of thousand bottles a year. I really think there is a large market for high quality and not so pricey sparkling wines internationally. Any wine importers reading this blurb?